All our TV channels have a database of panellists. Let me explain. Supposing a channel is doing a debate on politics the ‘booker’ (the guy who books the panellists for the show) types in “Politics” as a search-term into the database and up come Vinod Sharma, SwapanD and so on. You type… “Anything on Women” you are guaranteed to get Mamta Sharma of the NCW. You search “Elections”... Yeah you guessed right, you’ll get Yogendra Yadav & Co. You type “Islam”; you will likely get Zakir Naik and Shah Rukh Khan. You type “Expert on everything” you’ll get only one name: Suhel Seth. It’s like a Cola vending machine. You press a button and out pops a panellist. What’s the context? We’ll get there in a bit. In meantime let’s understand journalism a bit more. 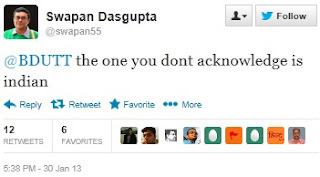 This is an interesting transaction between two friends; Barkha Dutt and Swapan Dasgupta. The lady fondly recalls Gandhiji on his death anniversary on January 30 and wishes we could celebrate him in a more ‘organic’ way. You can see SD’s light-hearted response. Now if you don’t know SD, he’s a killer of unsuspecting celebs with his subtlety. For the most part at least two of the Gandhi concepts that SD mentions are out of fashion. It’s the third one that Barkha picks on. Considering January 30 is a “prohibition day” across India she reminds SD and asks “guess which state has prohibition”? Umm, let me think, it can’t be Puducherry. It’s definitely not Goa. Assam? Nope. The little smirk at the end of her question tells me Barkha is thrilled at having another pot shot at a state she is not famous for being affectionate with because of that man with the silver hair and beard. But this is the alarming obsession with which our media picks their spokies, panellists and writers. One such product has landed them in some serious embarrassment; Nilim Dutta. Barkha may not have anticipated even in her great nightmares of Narendra Modi the cheeky, stinging reply that was to follow from SD. And when he says “the one you don’t acknowledge is Indian” and refers to Kashmir he leaves it unclear if by “you” he only means Barkha or a whole lot of other people. Prohibition in Gujarat has existed since it was born. Prohibition in Kashmir is the handiwork of Mullahs and extremists and not the law. So last year in July-August when Assam was burning our media mafia desperately needed an ‘expert’. No matter how many times they pressed the “Assam button” in the ‘expert-vending’ machine they could get only one name; Arnab Goswami. Hmm! But that guy had already joined the Judiciary and was running his own court on TimesNow. Arnab was also probably the only media celeb to attend the funeral of Bhupen Hazarika; remember? So they had to pick someone else. When it comes to Assam (or North-East as they generally refer to that unfashionable territory) they had all kinds of excuses to avoid coverage. You know, like Rajdeep Sardesai’s “deaths being lower than Gujarat2002, lack of OB vans, tyranny of distance” and all that. Damn! We run the mafia and we don’t have a local boss in Assam? We don’t have a ‘Wiseguy’? So maybe all the TV channels and poodles in the tabloids and newspapers looked up Twitter. Lo and behold, look what the cat brought in! The perfect Rat! This guy gave proof on December 6, 2011 that he wanted to chew LK Advani’s balls. And when they found the guy was equally anti-Modi they couldn’t believe their luck. Jackpot! So Nilim Dutta became the Assam expert for all them. Tehelka (yes even the ones who use call-girls for journalism), Firstpost, Indian Express, The Hindu, the online site Kafila, NDTV, BBC and others were thrilled to bits. For the media celebs on Twitter he became the Saint from Assam. Nobody cared to fact-check, nobody cared to do a background check. Nilim Dutta (ND) knew everything. He knew about Assam, about Bodos, about Bangla Desh. This guy was a ‘secular’ expert on everything just like Suhel Seth. Most of all, ND was a champion of the “secular” theory that the whole illegal Bangla immigrants was rubbish and this gave our media morons the weapon they wanted to counter the truth about the riots and the long standing strife in Assam. They were so carried away that they didn’t even bother to check who the guy is or what he does for a living. They were thrilled that he was running some “Strategic research and analysis organisation” which had its headquarters in the independent country of Facebook and a branch office on Twitter. What amazes me is that the guy was being exposed by Tweeple all along and still the media toasted him as a great find. You see, if you bear hatred towards Narendra Modi you are entitled to Gold Membership in the MSM club. That’s the only qualification you’ll ever need. When the moment arrived, our media was there to hand out a Platinum card to ND. 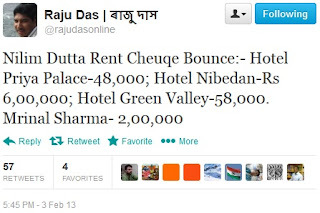 Raju Das from Assam lists ND’s minor achievements in a tweet. Other than that, ND also led people to believe he was a RAW agent (and yes secret agents do go around telling people they are that). He managed to fool Barkha Dutt and NDTV because, as I’ve shown, anyone anti-Gujarat is a hero and an expert. Sreenivasan Jain of NDTV runs a pathetically ironic show called ‘Truth V Hype’ and it borrowed ND (No, don’t confuse, NDTV doesn’t stand for Nilim Dutta TV). Then there’s Tehelka, whose editor Shoma Choudhury is the female version of Suhel Seth. She too is an expert on everything and hangs around TV studios and Litterfests most of the time. I can understand these guys, but following their choice of ND as an expert, even some reasonably careful sites like FirstPost got fooled and even the Beeb got fooled. 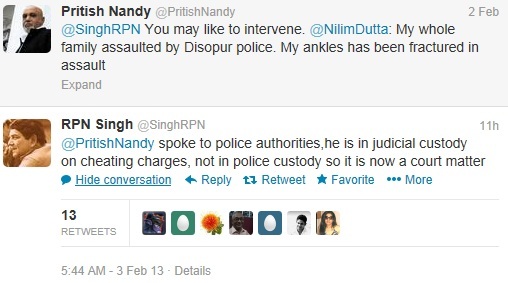 When Nilim Dutta was finally arrested he tweeted being assaulted by the police instead. 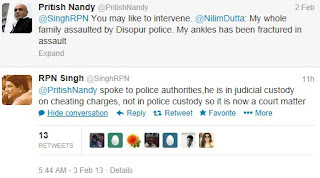 Friends like Pritish Nandy urged MoS RPN Singh (spouse of an NDTV anchor) to intervene. RPN Singh, who is a follower of Gandhiji’s “peace model”, immediately swung into action and called up Assam police. 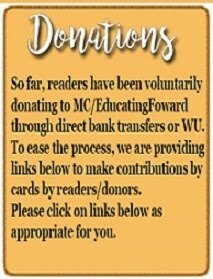 Educate yourselves: If you choose the career of a fraudster you have better chances of protection from the mafia and action from the highest offices of this land. In their haste to debunk the truth about Assam the media mafia picked up a guy with a dubious history. Rediff even points out: “Dutta, according to the police, is a serial offender in this regard. He was arrested and released on bail on 2004 on similar charges. The only difference is: this time he has Twitter celebs backing him, at least until now”! You can read the rest of the story everywhere in the media now and have a good laugh. Crooks who were defrauding the nation with their fake programmes, debates and articles can also get screwed by one of their own wiseguys. The best was that when ND was being arrested he had someone use Twitter to send a message that he was being “assaulted” by the police and that his ankles were broken by them. 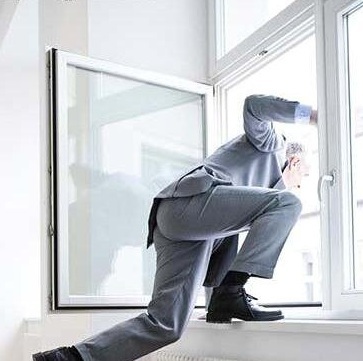 Turns out he was actually trying to jump out a window to escape. Nothing captures this better than this pic (Thanks to @Surnell who tweeted this). Long back I wrote about “India’s biggest mafia” and with sound reason. Every crime and activity you can find in the regular mafia, you can find in our MSM too. So there’s nothing to worry. The media mafia just added another feather in their proud cap. Excellent piece. Was waiting for this one. Would it be possible to comment on your article using Twitter or facebook too? Bravo Buddy. What takes my goat is the SOS from Pritish Nandy to RPN Singh, MoS Home. Pritish is the guy who heaps scorn on the Manmohan Government. Perhaps Pritish should apologise or his balls should be crushed as suggested somewhere in the article. Disgraceful conduct. It makes me laugh when Bengalis talk about Balls...ha ha. Why almost 100% morons in media and JNU are Bengalis? something in DNA? Good that Mr ND pissed this time while sitting on the shoulders of Sagarika,Barkha,Rajdeep,Pallavi ghosh, I hope the 3 divas would be singing...Tip Tip barsa pani, pani ne aag lagai!! 'Tip Tip barsa pani ...... by God,I couldn't hold laughing. simply the best. Sir, "The Word is not Enough" to appreciate your articles. This one too. He was a columnist for IE. As expected Shekhar, who is himself running for cover, has the story titled in IE as "Guwahati-based writer arrested, sent to custody". No ownership ??? So much for accountability. Its this what is normally reffered as " Tambu me Ghabrat". On a serious note the whole Congress Power system of Sold out Media, Jehadis, Nehru Clowns & corrupt babus is coming crashing down & causing a lot of comedy around us. he he. Long Live free journalism. Funny (and Shocking) part is the instruction that went out from Pritish Nandy to a Minister. :-O A summary direction - You may want to intervene. And our worthless Minister answers to that promptly. Wondering if there are more in common between PN and ND than just their bald hair styles and dark sunglasses. And there are a lot of other of his fair weather friends. They suddenly distancing means, they are worried ND may sing. I am sure there is far more to come. Waiting for the Story to unravel and some more shockers. Demystification of some celebs for sure. As always, another great piece. Agree with @Prashant Singh, can't find words to appreciate your posts, especially this one. ha ha :) I saw lot of tweets about Nilim Dutta and wanted to know more about this idiot ... your article provided me with everything I wanted to know ! sir, save for this article, i think a lot of time and energy is being wasted over this impostor. i guess, even you might get bored if i again say the article was a delight to read. You are amazing.Taking all of them not to the CLEANERS but to the DRAINS!! LOL!!!!! Regarding the "new" ND, he succeeds more NDs ... ND Tiwari ...., ND-TV , Haha Welcome to #Hallofshame. My Commode is leaking even after 3 Plumber patches !! ha ha ha . . Like your comment. But Isn't BJP and co. mai baap of all the Hindu fringes? Glad to read this. your blog provides us insight of media business. I am talking about this to more and more like minded people to read this blog regularly. Please keep it up. Superb piece! Just loved it. I am damn sure he is ND Tiwari's son. 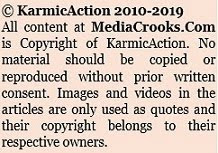 For unbiased news and views read mediacrooks...satisfaction and knowledge guaranteed! Shameful and despicable saga of nilim dutta nicely put. some of the so called vacuous strategic think tanks (or are they just one person) like takshashila also gave space to dutta. Keep up your work sir; it is much needed. Par excellence again Ravi! ND is just a reality check for these morons. There would be many more like him. Oh Boy!!! This literally takes the MSM crooks to the cleaners. That too with panache and style!!!! Great work of art Ravi, keep it coming!!!! Amazing, LoL..laughing all the way. What does "Organic Way" means? Good one, and Celibacy is control of organic dynamics. He looks like a villain of some Hollywood movie? I wonder Ravinar Ji kyaa Kabhi Burkaa Dutt aur unki badmaash company aapkey article padh k kyaa sochtey hongay ???? ki Agla phol kiska khulega (Mera number to nahin hoga na) !!! You are putting your hand in the ant hill. you need to have eyes and ears all around, your non passionate attack on MSM, un biased analysis of various events, will never make you darling of government or MSM. But we admire you and cherish your writing. All our good wishes are always with you and pray for your well being always. Definitely #Padma Awards for @mediacrooks from patriotic Indians !!!!! Take a Bow! How have I not come across this site earlier? I am going to be a regular! This Hartosh, seems to be the backup for Know-it-all Seth. !! What is the actual identity of Suhel Seth? Is he a corporate lobbyist (middleman) like Niira Radia. On behalf of which corporates he appear on TV channels? He seems to be quite well connected, enjoying the true fruits of the crony-capitalism. Review of Suhel seth's book...... in the garb of a self-help book Seth had written an autobiography! really funny line that. """Seth says his most important rule is: “Don’t make clients out of friends. But make friends out of clients.” Yet Suhel is friends with “almost everyone there is to know in the country”, or so the book’s jacket informs us. This may finally provide the explanation for why Get to the Top exists: he’s made friends at such a phenomenal rate that he must be running out of clients. "" For shameless MSM, mingling with some one accused of check bounces is no big deal. If ASM was welcome after his (mis)adventure, so would be ND. People have become immune to these sort of things.. He could be back on panels very soon..
@RAVIKIRAN ie., "Ati Vishisht Seva" medal for AMS!
" if you bear hatred towards Narendra Modi you are entitled to Gold Membership in the MSM club." "If you choose the career of a fraudster you have better chances of protection from the mafia and action from the highest offices of this land." Ravibhai, You nailed it, well said. Yes indeed, even after several commenters demolished Nilim Dutta's original article at Kafila by sound logic and statistics. Now Kafila is so afraid that they have closed comments on this issue! One of the commenters even pointed out a genuine research paper proving by SOUND statistics that demographical change is going on at an alarming rate in Assam due to illegal immigration post 1971 from Bangladesh. The paper is here: http://www.ijsrp.org/research_paper_may2012/ijsrp-may-2012-75.pdf Note that this paper is published in a peer reviewed journal and the authors are bonafide statisticians at proper academic institutions. In contrast, Nilim Dutta's Kafila article was an unreviewed essay by an author with dubious (and as we see now, completely fraud) credentials. Tamilnadu Chennai sathiyam News channel' crooked television channel, looted money from their viewers through sms to buy their new 2013 new year calender .i loose my money by sending sms still no response about that calender >in these juncture politicians better than this type of crooked peoples. Never seen true and unbiased articles like this, keep up the great work sir.